Alaska Airlines is my favorite domestic airline. It doesn’t matter if I’m flying first class or in the back of the aircraft, Alaska Airlines always makes flying a pleasant and enjoyable experience. They have the best employees in the industry and I really appreciate how much they value their flying passengers. On this trip, I flew from Los Angeles to New York on one of Alaska Airlines’ ex-Virgin America Airbus A320 aircraft. Alaska Airlines has the majority of these birds stationed on the West Coast for trans-con flights and the extra legroom and generous recline are definitely appreciated on these longer domestic flights. I’m a huge fan of these Airbus A320 aircraft and I’m glad Alaska Airlines utilizes them on these coast to coast flights. 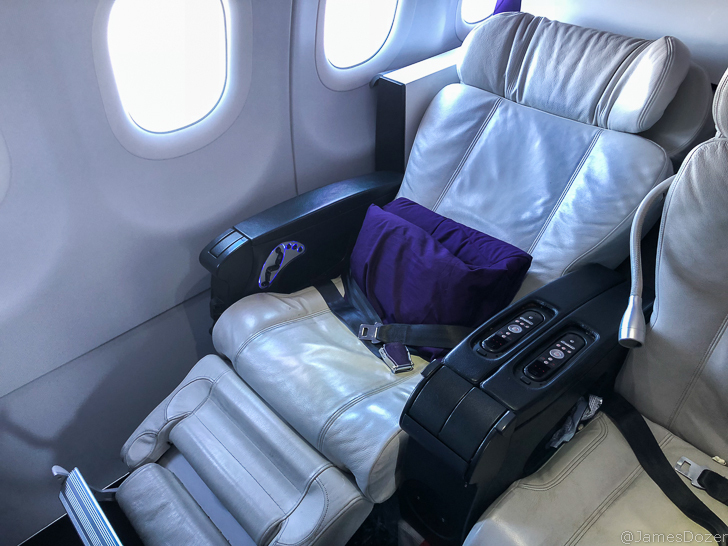 They have first class seats that are wide, spacious and comfortable and the onboard amenities and attentive service help make the 6-hour flight fly by. At LAX, Alaska Airlines operates from terminal 6 and utilizes its own Alaska Lounge for first class passengers and Alaska Lounge members. When capacity limits allow, the Alaska Lounge LAX is also a Priority Pass Lounge. The lounge offers a small, yet comfortable, space to rest and relax before your flight. I’ll have a full review of the lounge up in a few days but in the meantime, here are some pictures. After a plate of pancakes and some coffee, I left the Alaska Lounge and made my way to gate 60 for my flight. I arrived at the gate at boarding time and jumped in line with everyone else. All passengers boarded the aircraft through door 1L. On this trip, I was seated in seat 2F, a window seat located on the right side of the aircraft. These Airbus A320 aircraft are configured with two rows of domestic recliner seats in a 2-2 layout. The seats measure 21 inches in width and provide a whopping 55 inches of pitch. There is a ton of personal space around the seat but the one downside is the lack of usable storage spaces. No underseat storage is available so everything needs to go up top. However, smaller items such as eyeglasses, cell phones, iPads and laptops (under 13 inches) can easily fit into the seatback pockets in front of you. 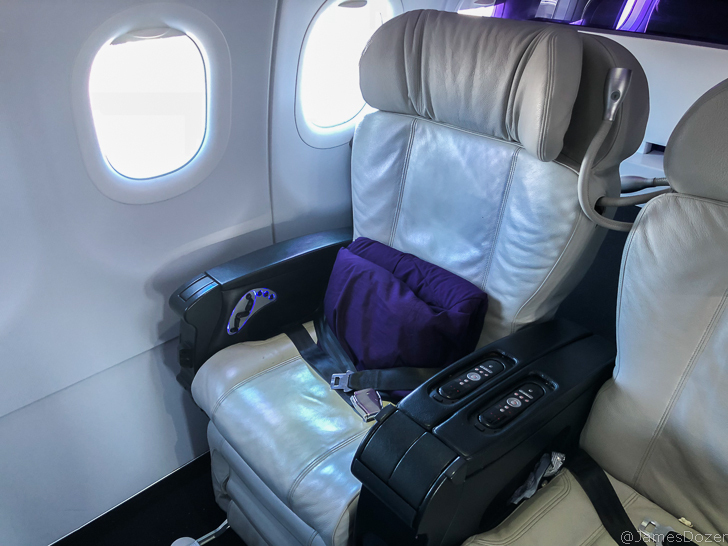 Each first class seat features an in-flight entertainment monitor (folds out from the center armrest), USB port, individual electrical outlet and a personal reading lamp. In terms of entertainment, Alaska Airlines provides a great selection of Hollywood movies, TV shows and music playlists to keep you entertained. You can expect about 40 Hollywood movies and another 40 indie and classic films. Not bad for a domestic flight. Waiting at my seat was a packaged blanket and pillow set and pair of plastic headphones. No amenities kit was provided. As I settled into my seat, the flight attendant came by to offer me a pre-departure beverage and a menu card. It was too early to drink so I ordered an orange juice. As the final passengers boarded, the captain came on the PA to welcome everyone on-board and provide us with our flight time, flight path and estimated turbulence. We then pushed back from the gate, made our way to runway 25L and departed for New York on this cloudy and overcast day. Viasat WiFi was provided on this flight for $19.99 for the duration of the flight, unlimited data. For those just looking to keep in touch with friends and family on the ground, messaging connectivity (iMessage, Facebook Messenger, Whatsapp, etc.) was provided free of charge for all passengers. Once we reached our cruising altitude, the seatbelt signs were turned off and our flight attendant prepared for our meal service. She came by with a hot towel, set my table with a white tablecloth and then served a pre-meal drink. For my breakfast, I chose the avocado and bacon omelet, which was served with a side of potatoes, strawberry lime smoothie shot, Greek yogurt with berries and mint and a bread roll. Another round of drinks was also provided. If you couldn’t tell by the pictures, the food was pretty darn good. I normally don’t like airplane breakfasts but this meal tasted fresh and flavorful. The avocado and bacon omelet was one of the best omelets I have ever had on an airplane and the yogurt was cool and refreshing. I really love Alaska Airlines’ new and improved seasonal menus. Service-wise, there was only one flight attendant working the first class cabin and she was great. She was on her feet the entire time, serving food, refilling drinks and otherwise assisting passengers. She was polite, attentive and really went out of her way to take care of passengers. After my tray was cleared, I got some work done on my laptop, watched Thor: Ragnorak and then slept for about an hour. When I woke up, we were preparing for our initial descent into New York. No other meals or snacks were officially served prior to landing but as a first class passenger, you can order any of their food items (including the items sold in coach), anytime during the flight, for free. In terms of seat comfort, domestic recliner seats don’t get much better than these. These Airbus A320 seats are wide, spacious and have a ridiculous amount of recline and personal space. These seats do not recline flat but are similar to “lazy boy” recliner chairs. They offer a nice deep recline and provide a comfortable leg rest to support your legs. Alaska Airlines offers a quality first class product. These seats are spacious and comfortable and provide a ton of legroom. The in-flight entertainment system is great and offers a large selection of movies, TV shows and music to keep you entertained. But in my opinion, what makes Alaska Airlines special is their service. Alaska Airlines, and now Virgin America, has the best employees. They are nice, friendly and really go out of their way to make sure you have a pleasant flying experience. James Dozer traveled to New York as a guest of Alaska Airlines.